OK, I have a secret. I’ve been asked to leave a Chinese buffet. No, I didn’t go flying Nikes over head like when Jazz annoyed Uncle Phil on Fresh Prince of Bel Air. It was more like Martin pushing Pam out the front door “Get to steppin’” I’m not proud of my gluttony but I really like Chinese food. You see, at the buffet I have a process, first round, scope out the offering. Then I have to devise the plan of action because you can’t just mix everything on your plate. I’ve got to get the flavour ratios just right and, note to Dad, sweet and sour sauce can’t go on everything. A proper balance of sweet and salty and sour, bitter and savoury has to be attained and I’ve got to try everything. So, on my fifth or sixth plate (I mean full plate not just a little spoonful of this and that) the waitresses began to hover, circling like wolves ready to pounce on a defenceless baby deer. One by one every few minutes they’d come to the table, eyes rolling, to ask in thickly accented English “You finished yet?” (Annoyed translates well in any language.) To this question I happily answer, “No” and continue savouring ever morsel of Chinese goodness while receiving the evil eye from a pack of angry silk clad waitresses. Then the next comes huffing, hands on hips to try to budge me. The serious buffet waster (aka my two plates only Mom), who had finished eating 30 minutes before the army began to descend, finally whispered to me “I think they want you to leave.” But I hadn’t even had dessert yet! So, to avoid more embarrassing moments at the buffet, I’m learning to make my own Chinese at home. My teacher and best friend (in my imagination) is Ching-He Huang, host of Chinese Food in Minutes in the UK and Easy Chinese – San Francisco in the US. 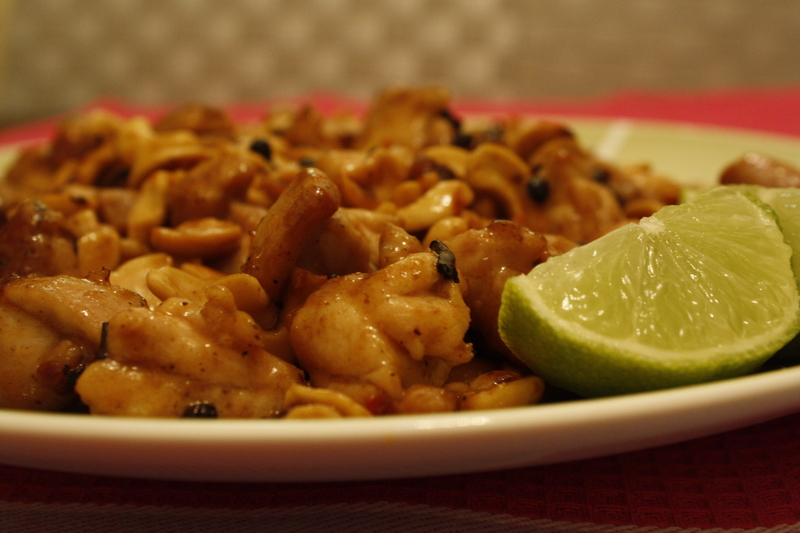 Here is one of my favourites from Ching plus a one of my own to show just how easy and quick Chinese food can be. I suggest preparing all ingredients and lining them up near the wok. This dish goes really quickly so it’s important to have everything right at your fingertips. Mix the water into the cornstarch (the water has to be cold and it has to be added to the cornstarch not the other way around to avoid lumps). Season with the 5 spice powder and set aside. Heat a wok on high heat until it starts to smoke. Add the oil and when it begins to smoke add the peppercorns, chilli bean paste and chilli. 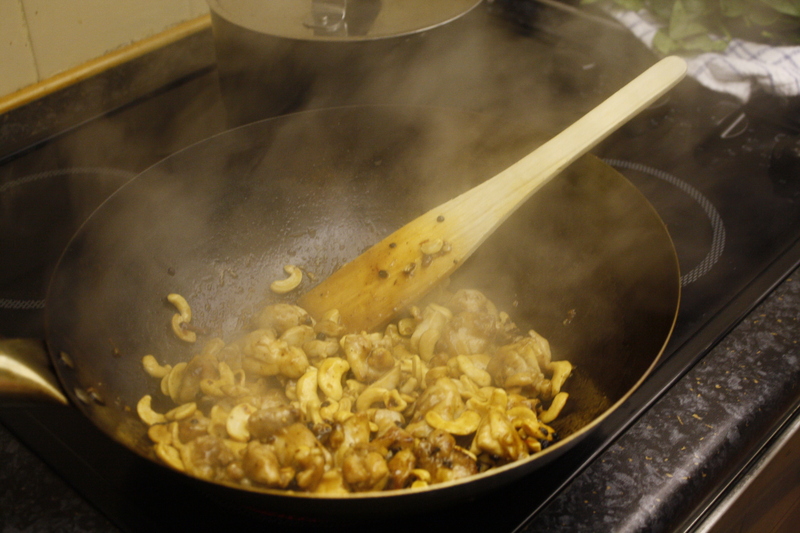 Lift the wok off the heat and toss the mix around for 10 – 15 seconds. 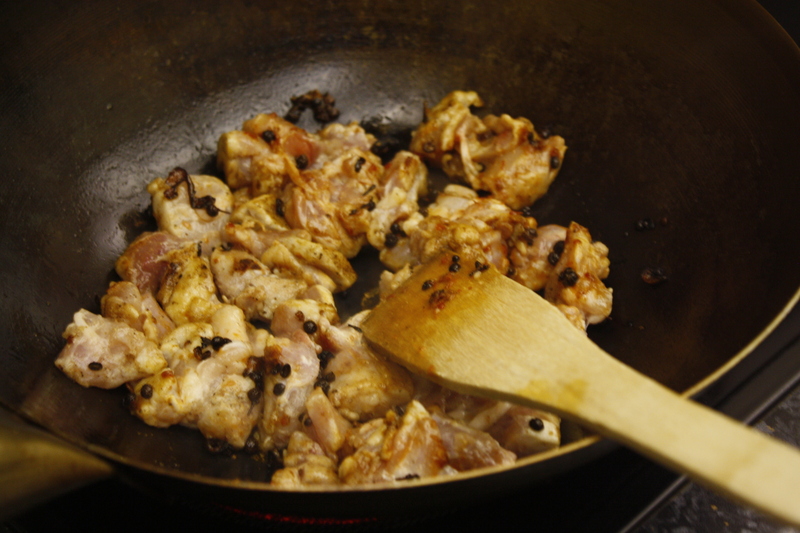 Place the wok back on the heat for another 10 – 15 seconds so the wok can heat back up and then add the chicken. Let the chicken cook for a minute before stirring then add the rice wine. Mix it all together and then let the chicken cook until it turns white (about 4 – 5 minutes). Add the cashews and cook for another minute. Once chicken is cooked through, turn off heat add soy sauce and lime juice. Serve with steamed rice and Pak Choi in Oyster Sauce. Separate the stalks of the pak choi from the leaves. 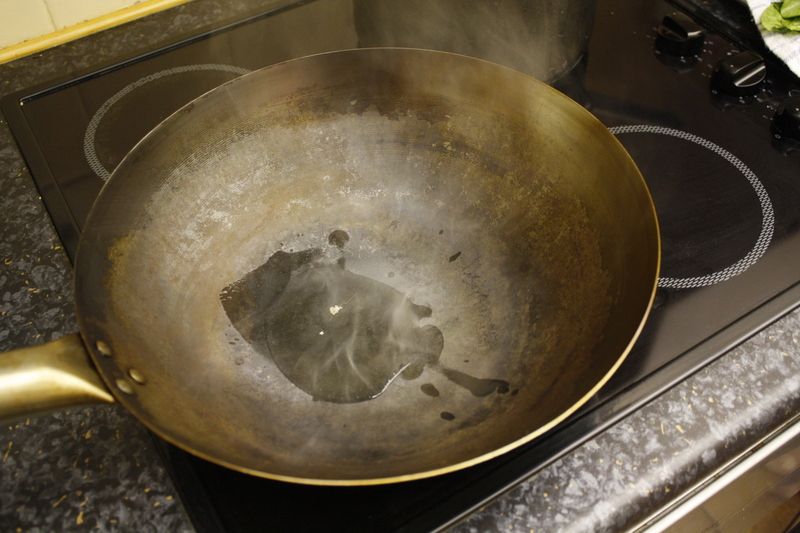 Heat oil in a wok or heavy gauge frying pan until smoking. Add garlic and fry for 2 -3 seconds, add stalks of pak choi and stir fry. Splash with water to create steam to cook stalks (repeat if necessary). Stir fry for 1-2 minutes then add leaves, soy bean paste and oyster sauce. Stir fry for 20-30 seconds until slightly wilted. Next Post Cookies are supposed to make you happy! thanks…I love chinese food too. I will try this recipe. I’ll have to buy some new items so please continue giving chinese recipes, so these new spices won’t go to wase. I hate to buy items that I only use in one recipe! Click on the links to Ching He Huang. She’s got loads of recipes that are simple and taste better than anything you get at most restaurants.